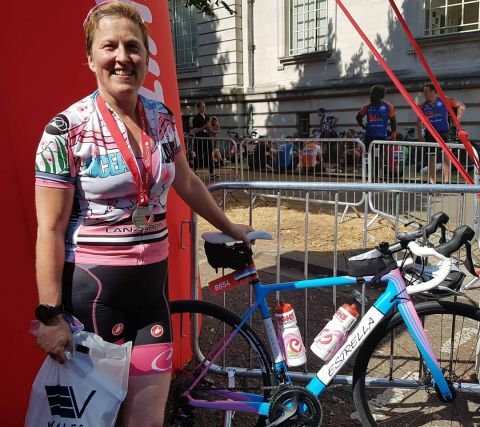 Estrella ambassador Penny Harris has been riding bikes on and off since she was six years of age and as many do in sport, has drifted away from it and then drifted back. Penny competes in triathlons, a sport many a cyclist has moved to or come from and also likes a sportive too. Asked how much time she devotes to training on the bike each week, Penny replies “the time on the bike each week varies depending on the season. Usually a minimum of a couple of hours at the weekend and a couple of hour long turbo sessions in the week. The longest training ride has been 7.5hrs when I was training for Challenge Roth”. 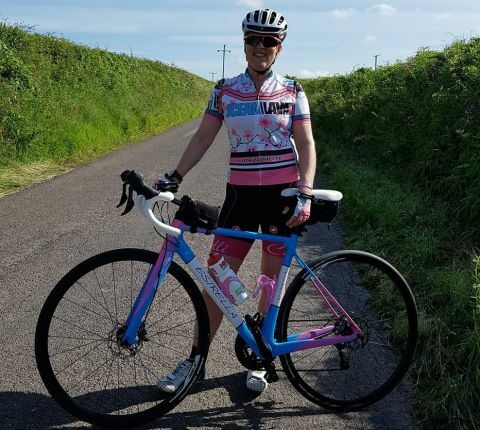 Penny rides the Estrella Liso disc and it is used for triathlons, cycle sportives and exploring the beautiful south west Pembrokeshire countryside. It has Shimano 105 groupset, Prime Alexrim wheels with Michelin Krylion 2 Endurance tyres”. “I love the feel of the bike, the fact it is fast, responsive but also really comfortable, no matter how long the ride. And it is British! I love the colour and the number of people that comment on it as well” added Penny. Our thanks to Penny for taking part in the Q & A …. Good luck to Penny for the rest of the season.